In my experience, there are three types of watchmaker: those who focus on aesthetics; those who focus on mechanics; and those who focus on precision. You could of course argue that someone focusing on precision must focus on mechanics. Or that aesthetics come into play for everyone. And you wouldn’t be wrong. However, if you look carefully at the driving ideology behind brands and independent watchmakers – despite what they say inspires their watches – I believe it can be boiled down to one of those three. The best among them can balance the three fairly well, but there is always one of the trio driving decisions. Take Jaquet Droz for example, a brand that is literally the expert when it comes to automata, the most mechanical things you can work on. Yet based on its entire collection, it is clear that design, style, and overall aesthetics drive development across the board. Urwerk is just the opposite: mechanics are clearly the engine that shape what this brand is about. While Urwerk has surely have come up with ideas showcasing ultimate precision (see Urwerk AMC: Atomic (Clock) Mechanical Control Is A 21st Century Version Of Abraham-Louis Breguet’s Sympathique Clocks But Much, Much Better) and making things that look pretty darn cool, it is always the mechanics that are at the center of every idea. One brand focusing on precision and largely underserving both mechanics and aesthetics would be Rolex. The Swiss crown has stuck with chiefly the same designs for half a century, preferring not to generally develop new, interesting, or wild mechanics. But it has nearly perfected the manufacture of consistently precise and extremely reliable watches on a large scale. The proof is in the production methods for each. Jaquet Droz emphasizes métiers d’art; Urwerk creates small runs of complicated and tricky-to-assemble movements; and Rolex has one of the most advanced robotic production lines to maximize repeatability and minimize human error for long-term consistency. All brands pay attention to the three aspects to some degree, but not every brand seeks to create something extremely accurate or mechanically impressive or worthy of being called art. But there are a few out there that go after the horological trinity as often as they can, and today I highlight one of them. It should come as no surprise that I think Andreas Strehler is one of the rare few that seeks to appeal to all three disciplines when creating his watches, with a strong focus on precision – something that others talk about but rarely demonstrate. Strehler’s latest watch, the Trans-Axial Remontoir Tourbillon, takes his definitive style to create an even more accurate timepiece than he has made before. And since he also likes to focus on impressive mechanics, he has done it in a way that definitively stood out among the multitude of new watches presented at Baselworld 2018. Trans-axial? A co-axial rose by another name . . . It all circles around the first and second part of the name: Trans-Axial and Remontoir. You might think it is about the tourbillon, but that is only part of the answer as the implementation of the remontoir with the tourbillon is what sets this watch apart – even from Strehler’s own watches. Strehler has a history of using a remontoir d’égalité in many of his timepieces – an element that loads and reloads a small spring to keep constant power coming to the movement’s regulator – so clearly precision has been on his mind for a while. He has also created an epicyclically limited twin mainspring setup that only uses the most consistent portion of the mainspring’s torque curve for even more reliable operation. But never has he placed a tourbillon into one of his movements before, and that is at least partially because of the dubious usefulness of tourbillons in wristwatches. But some tourbillon watches have proven this dubiosity wrong by winning chronometer competitions like Greubel Forsey (see Why Accuracy Matters To Me, And Why It Should Matter To You Too), showing that with the right circumstances and adjustment tourbillons are more than just complicated mechanical decoration. Finally it came to pass that Strehler decided to build a movement with a tourbillon for his collection. But he avoids the typical implementation, which sees the word “trans-axial” entering the arena. This word was chosen for two very important reasons: one, in a car, a transaxle usually indicates an integrated system that translates rotation in the same location as the engine, similar to the tourbillon mounted on the remontoir d’égalité. The second reason is that the more obvious name – co-axial remontoir – would have caused confusion with George Daniels’s famous co-axial escapement now implemented by Omega and Roger Smith. For that reason, Strehler traded one description for another and avoided linking his invention with any other mechanism, watchmaker, or brand (very smart). So how does the Trans-Axial Remontoir Tourbillon work? It all starts with the tourbillon. Instead of connecting directly to the basic gear train, it is driven off the remontoir d’égalité to ensure consistent rate and amplitude resulting from constant force to the balance. So far there’s nothing new there. But some watches that have featured a tourbillon coupled with a remontoir d’égalité may see the remontoir positioned further up the gear train, providing something between five and sometimes 60 seconds of power. Only a few watches have featured the remontoir directly next to the tourbillon (if my memory serves), providing one-second increments of constant force. But Strehler still takes it further and mounts the remontoir d’égalité and the tourbillon on top of each other, using the same rotational axis and turning it into an integrated system. The benefits of this include a more open layout for the gear train since extra room for the remontoir isn’t needed, an increase in efficiency by reducing the distance from the power source to the balance, and reduction in energy loss from positional variations since they move together. This layout also makes for added visual depth to the movement since two critical components are layered on top of each other. On the rear of the movement, it also causes a spectacularly large wheel that connects the remontoir d’égalité/tourbillon assembly to the gear train, providing a handy point to add dead beat seconds to the dial. The dead beat mechanism consists of a very delicate ratchet wheel held in place by a single pallet jewel, which is fixed to the pinion that ties the fourth wheel and remontoir pinion via the large idler wheel on the rear. It’s rather stunning and keeps the rear of the movement nearly symmetrical. Back on the front side of the movement there is a power reserve indication driven by a micro-sized differential that adds a fair amount of complexity to an already complex watch. You will also find a set of sapphire crystal wheels driving the hours and minutes. This helps keep the skeleton dial from being overly cluttered and provides a view of the top-notch finishing. The only odd thing is the placement of the power reserve scale and the indicator hand. The hand sort of weaves its way through the movement and points to a less-than-obvious scale near the time display, making it a bit hard to see at a glance. And yet the power reserve doesn’t distract from the fact that the Trans-Axial Remontoir Tourbillon is a very cool assembly of mechanics, aesthetics, and precision. This time, it does seem like precision and mechanics battled it out for superiority, though in the end the winner is us. It looks cool, following design cues and finishing standards typical to Andreas Strehler’s watches, and the search for precision saw some interesting mechanical solutions. With Strehler’s desire to seek precision, exemplified by the two-million-year moon phase (see Andreas Strehler Entered Into ‘Guiness Book Of World Records’) and the nearly ubiquitous addition of constant force to his movements, this new piece feels like a logical next step. It is a bit different than some previous models, but it largely follows suit and makes a great addition to the collection as a sibling to the Papillon. One thing that is for sure: the new Trans-Axial Remontoir Tourbillon shows that Strehler isn’t exactly resting on his laurels and swapping dial materials. Instead, he is always trying to push forward with mechanically-creative ideas superbly executes. With all of the work his movement company UhrTeil does for other brands, it’s great to see that Strehler isn’t giving all his good ideas away, either. He is slowly and surely expanding his repertoire for his eponymous brand. And with his first tourbillon, this could mean he may begin exploring traditional complications in future models, though I hope he continues with astronomical complications as well since he has proven his expertise in that arena. Still, the Trans-Axial Remontoir Tourbillon is a serious contender for the best of Baselworld 2018, and even after the hubbub caused by other brands’ interesting choices, Strehler stood out as a rightful master of all things horological. Now on to the breakdown! 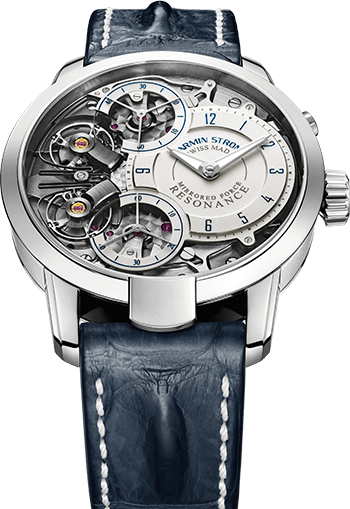 Wowza Factor * 9.55 The first tourbillon from Andreas Strehler – and with all the other mechanics too! Late Night Lust Appeal * 89.5 » 877.695m/s2 Watching the coordinated dance of the tourbillon and the remontoir d’égalité will lull you into a trance! M.G.R. * 66.1 In-house movement by Andreas Strehler, that is already pretty geeky! Added-Functionitis * Mild Power reserve indicator is the only official added function since the rest are only a unique ways to create mechanisms! You’ll probably need children’s strength Gotta-HAVE-That cream for the underappreciated swelling! Ouch Outline * 11.1 A twisted shoulder from not knowing your limits! I used to be a pitcher in high school baseball and I did not properly take care of my arm and shoulder after games. Now I pay the price when I toss a rock into the lake too hard. But I would throw all day if it meant this bad boy was strapped to my wrist! Mermaid Moment * Every second! Watching the remontoir d’égalité mounted to the tourbillon gives you a reason to book a caterer! Awesome Total * 828 Multiply the number of components in the movement (250), by the number of gold chatons in the movement (3) and then add the number of hours for the power reserve (78) and you are left with one precise awesome total! For more information, please visit www.astrehler.ch/transaxle-tourbillon.